In 1943 Col. Juan Peron took part in a successful military coup in Argentina, beginning over a decade in which he dominated the nation's political life. After promoting populist policies as Minister of Labor under the military government, Peron built a deep well of support among the working classes that enabled him to win election to the presidency in 1946 and 1951, however political opposition to what was perceived as his Fascist sympathies, demagoguery, and authoritarianism increased. In 1955, Peron was ousted in a military coup and driven into exile in Spain. 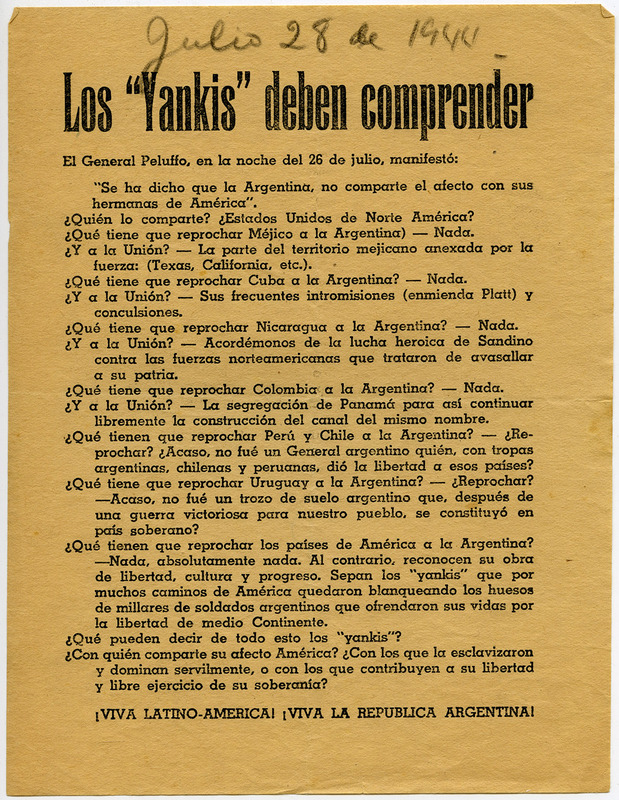 Consisting of materials produced in Argentina just prior to and during the era of Juan Peron (1946-1974), this collection of pamphlets, fliers, broadsides, news clippings, and campaign literature provides a unique window onto political developments in the South American nation. The ephemera addresses a wide range of subject matter, from World War II to economics, political controversies, relations with the United States, the election of 1951, the Revolucion Libertadora coup of 1955, and Juan and Eva Peron. Both Peron's Partido Justicialista and his opponents, including Communists and Socialists, are represented.